Whilst I’ve been busy moving house Kerrie’s A-Z Crime Fiction meme has featured the letters J and K. Now that I have the computer up and working (well D actually did that for me) I’m having a little break from unpacking boxes to add to the series. I’ve written about the following books earlier in this blog and have adapted my reviews for this post. J is for A Judgment in Stone by Ruth Rendell. This portrays Eunice, an illiterate woman and a psychopath who does anything to stop anyone from finding out that she can’t read or write. Her ingenuity and resourcefulness is amazing. She blackmails people and killed her father. I found the whole premise of such a damaged person apparently functioning normally in society scary. She is employed by the Coverdales as their housekeeper and in the interests of having their house kept clean and tidy they tried to make her comfortable. But part of the problem was that they looked on her as little more than a machine, not as a person. They meant well, wanting to make other people happy, but they were interferers and things went from bad to worse. Then Eunice met Joan, who was completely unstable, in fact she was insane. Joan is a religious fanatic, a sinner who delights in telling people of her past sins and wanting them to seek God’s forgiveness. Their friendship ends in tragedy. I felt helpless whilst reading this, desperately wanting the Coverdales to realise Eunice’s problems, but they were blind to the fact that Eunice was illiterate and although they tried to prevent her meeting Joan they were unaware of the danger they were in. This inflamed Eunice and pushed her into taking the actions she did. 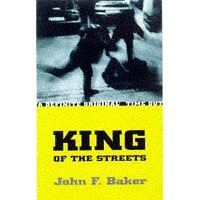 is for King of the Streets by John Baker. I read this over two years ago. It depicts violent murder in graphic detail, which I found hard to stomach and the subject matter of the abuse and murder of children is neither easy nor pleasant to contemplate, but it’s a quick read. This was the third book I’d read by Baker, all set in York and featuring the private detective, Sam Turner and his assistant Geordie (naive, but street-wise). Sam is investigating the murder of a blackmailer and the death of a teenage runaway, hampered by a gangster and his “minders”. It’s well written, giving insight into the minds of both the detective and the criminal characters. I particularly liked the nickname ‘Gog’ for one of the ‘minders’, who trashes Sam’s office. Gog is, as the name suggests, a huge giant of a man, with little reasoning power, but plenty of brawn, looked after (not very successfully) by his brother, Ben. Baker also refers to Gulliver’s Travels in describing Gog as ‘Brobdingnagian’. At times I even felt sorry for Gog. I enjoyed this book immensely, despite the violence it portrays. A Judgment in Stone is one of my favourite crime novels. Quite unforgettable. I’m also glad you mentioned John Baker. John has pretty much given up writing crime, which is a real loss to the genre, but he continues to write, and to blog. I thought the Rendell book was excellent.